Hands up who wants a Union Jack, Pastel Dotty or Fire Engine themed balance bike? Then you will love the range of wooden Kiddimoto balance bikes that are British made and are among the best wooden balance bikes available. There are also lightweight metal bikes as well as BMX bikes and mod scooters on offer from Kiddimoto to complete their range. A fantastic choice during your search for the best balance bike! The most well known bikes of the Kiddimoto range are the Kiddimoto Kurve balance bikes, which are beautifully designed wooden bikes with a gracious curved styling and a sturdy construction manufactured from birch ply wood. 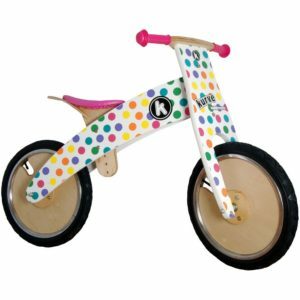 The Kiddimoto Kurve balance bikes come in a wide range of exciting and distinctive styles, including Police, Fire, Flower, Union Jack and Pastel Dotty (one of our favourite pink balance bikes). Other options include Red Dotty, Skullz and a funky Splatz style so there should be something for everyone! This is a relatively high starting saddle position so the bike would be too big for 2 year olds. However, it would be ideal for 3 or 4 year olds who are just starting to learn to ride. 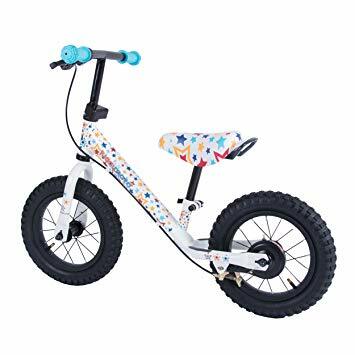 As a comparison, our recommended balance bikes for 2 year olds such as the Weeride First or the Strider Classic have saddle heights starting between 29 - 31cm. Other features of the Kiddimoto Kurve balance bikes include a 12 inch pneumatic tyre with inner tube and safety is also a priority with a steering lock that stops the bike from turning more than 30 degrees and preventing jack knife. The comfortable rubber hand grips protect little hands and the bike weighs in at 4.5kg. Kiddimoto Kurve offer award winning, British designed bikes and are generally available for around £60 - £70 making them an excellent choice of balance bike. The second bike in the Kiddimoto range is the Kiddimoto Super Junior Balance bike, which we has also reviewed in a separate post. This is completely different from the Kiddimoto Kurve, as it is made from metal and has a lower starting saddle height so it is great for younger children. It boasts an impressive range of features, including a padded seat for comfort and an adjustable saddle with a minimum height of 34cm. This can extend up to 45cm so it can grow with your child until they are ready for a pedal bike. The lightweight steel frame makes the bike easy to transport and it is available in a number of funky and exciting colours for around £60. The Kiddimoto Super Junior Max is based on the same frame as the Super Junior, but offers a number of extra features such as a brake for the front wheel, an extra grippy footplate and pneumatic air tyres. This makes for a more comfortable ride and a superior performance, although the extra weight of this bike would make it more suitable for children aged 3 and above. A carry handle is also included on the seat for if (and when) the child gets tired. Similarly to the Kiddimoto Kurve, it is available in a number of funky designs including the Union Jack, Stars (pictured), Skullz and Pastel Dotty. The extra features make it around £20 more expensive than the Super Junior bike so is available for around £80. 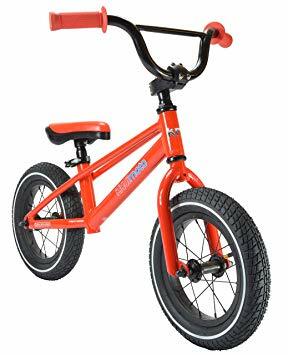 This high quality, BMX style balance bike is perfect for any terrain with a lightweight, durable frame and 12 inch pneumatic tyres. The bike has a saddle height starting at 38cm, so it is ideal for slightly older children aged from 3.5 – 5 years. The bike is painted in a striking gloss red, so it looks great and weight in at just 4.8kg. Our final featured bike from the Kiddimoto range is the Kiddimoto Scooter Wooden Balance bike. 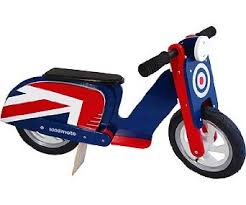 This is an excellent replica of the real thing, with the Union Jack design based on the iconic Mod Scooters of the 1960’s. The scooters are manufactured from sustainable birch plywood, and feature footboards for freewheeling as well as pneumatic tyres for a comfortable ride. 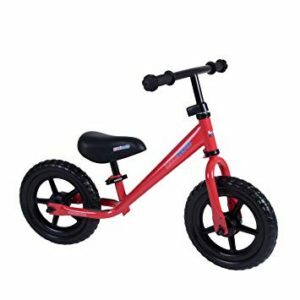 The saddle is not adjustable on this bike, so it may only be suitable for your child for a short while – but it is fun bike balance bike and one of the most distinctive models available. Kiddimoto also offer a great range of accessories including a number of kids helmets which are perfect for smaller heads. Designs include Police, Pastel Dotty and Pink Goggles. There are also kids bike gloves available to complete your outfit and to make sure your child is fully protected while they are out on their bike.